PhD (Public Policy and Administration) student Kennedy Alatinga successfully applied for the Population Reference Bureau's (PRB's) 2014-2015 Policy Communication Fellows program. He is invited to attend a two-week workshop in Washington, DC from August 4-15, 2014 and will be asked during the 2014-2015 academic year to apply the lessons learned at the Washington workshop and to prepare written and oral presentations for policy audiences, based on his dissertation "Poverty and Access to Health Care in Ghana: The Challenge of Bridging the Equity Gap with Health Insurance". Additionally he will have the opportunity to present his findings at a special PRB workshop held prior to the 2014 Population Association of America (PAA) Annual Meeting, April 30-May 2, 2015, which will be held in San Diego, California. 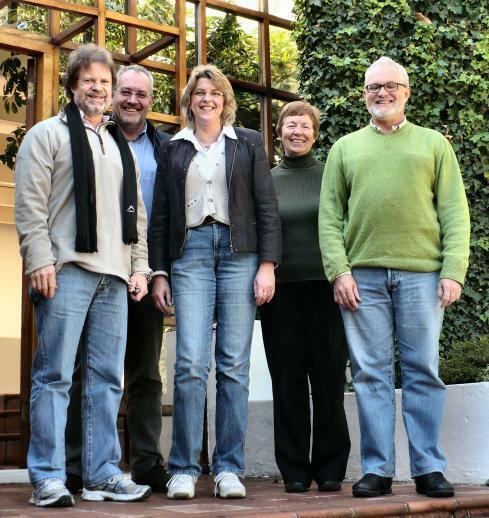 The steering committee members of the South African – German Centre for Development Research and the academic coordinator of the CDR at UWC met in Stellenbosch from 9 – 11 May 2014 to discuss strategic options for further developing the fields of cooperation during the current funding period and beyond. CDR is currently supported by DAAD within the African Excellence initiative until end of 2018. Partners agreed to intensify cooperation in research in the coming years to supplement ongoing activities in academic training of Master and PhD candidates at CDR and in the frame of the Erasmus Mundus Action 2 project EUSA_ID. A new paper of our "SA-GER CDR Research Paper Series" is published. The Paper of Dr. Samson Lembani (2014): Institutions and Veto Players in Legislative Decisions - What and Who matters in Legislative Decisions in Malawi? can be downloaded from the "Research Section" of our website. 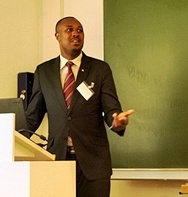 On 17th March 2014, our MADM Alumni Gerald Ahabwe was overwhelmingly voted the President for the Association of Ugandan-German Alumni (AUGA). AUGA is a voluntary Association established by individual members who were or are still beneficiaries of various German scholarships at German, Ugandan or international Universities or who studied at least three months at a German University. DAAD is offering approximately 10 Postdoctoral Fellowships in 2014 at DAAD supported Centres of Excellence in Sub-Saharan Africa. For more information, please have a look at the Fellowship Announcement for Sub-Saharan Africa or the Fellowship Announcement for Germany. 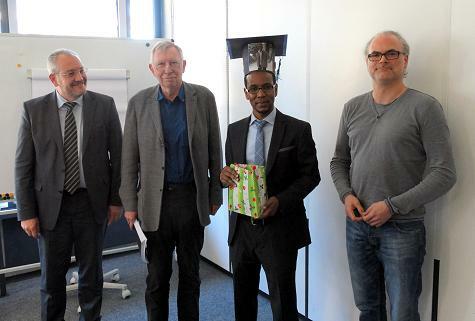 On 10 March 2014, Silas Udahemuka from Rwanda has been awarded the degree of a Doctor (Ph.D.) in International Development Studies (IDS). He received a DAAD-funded scholarship of the South African-German Centre for Development Research for his doctoral studies. His thesis, "A Big Push to Break Rural Household Poverty Trap? Millennium Villages Case Study with Emphasis on Agriculture“ has been supervised by PD Dr. Stefan Karduck, University of Cologne, and Prof. Dr. Werner Voß, Ruhr-University Bochum. The new EUSA_ID project is a mobility programme offering study, training and research periods in Europe for South African Master and PhD candidates and staff and provides European PhD candidates the opportunity to spend a research period in South Africa. This project is funded by the European Commission within the framework of the Erasmus Mundus Partnerships programme. The overall budget for the period 2013 – 2017 is nearly 2.3 million EUR. It allows for the award of 66 grants to support mobility of South African individuals to one of the European partner universities. South African Master and PhD candidates have the opportunity to apply for full degree studies in Europe or to spend a shorter study period abroad. South African university staff members have the opportunity to spend a research or training period in Europe. In addition, a total of 18 grants will be awarded to support the mobility of European PhD candidates to one of the South African partner universities for durations between 12 – 24 months. The partnership is coordinated by the Institute of Development Research and Development Policy of Ruhr-University Bochum. The University of the Western Cape (UWC) acts as joint coordinator on the South African side. Overall the consortium consists of 6 South African and 7 European Higher Education Institutions and shares the expertise in complementary thematic fields related to Development Studies which has been chosen as common umbrella. It is supported by 3 associated partners, who foster promotion of the project and provide support related to facilitate study recognition and quality assurance. For more information on EUSA_ID please visit the new project website. The first call for scholarship applications is also published there. 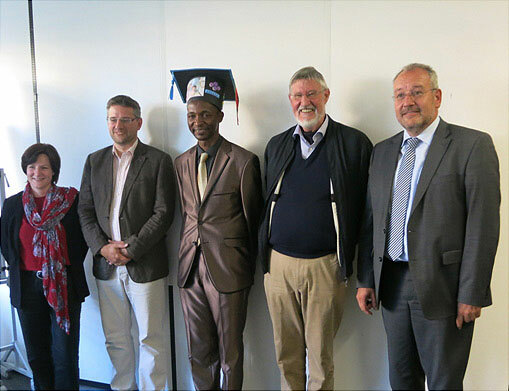 DAAD Student Samson Lembani from Malawi has been awarded the degree of a Doctor (Ph.D.) in International Development Studies (IDS). He received a DAAD-funded scholarship of the South African-German Centre for Development Research for his doctoral studies. 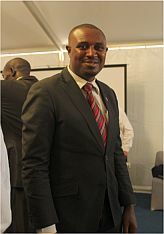 His thesis, "Institutions and Actors in Legislative Decisions in Africa: Analysing Institutional Contexts and Veto Players in Legislative Decisions in Malawi", was supervised by Prof. Ch. Hartmann and Prof. U. Andersen.